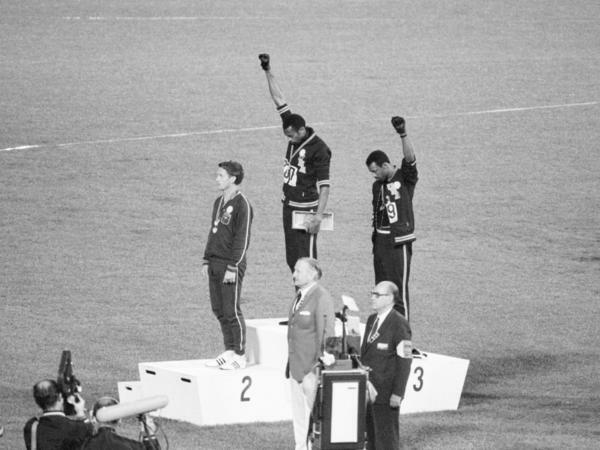 Tommie Smith and John Carlos, gold and bronze medalists in the 200-meter run at the 1968 Olympic Games, raise their fists to protest the inequity and discrimination that black people in the U.S. face. Now, 50 years later, a team of NPR research librarians, social media producers and reporters are capturing those moments and more with our Twitter project, @todayin1968. Through that account, we'll tweet news and articles from 1968 as if it were all happening today. In addition to major events, we'll share "everyday" parts of life — like the change in price for stamps or Billboard hits. This is a revival of NPR's project from five years ago, @todayin1963. Follow along on Twitter as we rediscover 1968. Let us know if there are any key dates, events or people that we should be on the lookout for. Send us a tweet at @todayin1968. NPR interns Kevin Garcia and Kumari Devarajan are also contributing to @Todayin1968's research.